Real del Mar residential community originally set the tone for the beautiful styling and ambience that followed suit on the Punta de Mita corridor, borrowing from Careyes style with homes suspended on cliffs, employing soft architectural edges, tile and thatch in sophisticated applications and handcrafted wood and stone detailing of the finest workmanship. The unique integration of homes into the six gentle summits that make up its 30 acres of land set on a ribbon of waterfront with one of the areas most idyllic, pristine beaches is nothing but dreamy. Its manicured jungle is the epitome of landscape architecture. Equidistant between Puerto Vallarta and Punta de Mita, it is the acme of luxury homes. The master plan architects could never have known that the already-amazing vistas upon Vallarta and the outer bay would be further enhanced by the addition of the Marina Riviera Nayarit, which came along in recent years and now embellishes the view of many of the south-facing homes. What makes this property that much more alluring is its comfortable, rather than pretentious, air. Casual elegance is the perfect descriptor. If you have a vessel, temporary off-shore anchorage is easy on gentle waters that make shuttling to the main beach hassle-free. A complete spa, gym and tennis facility complements the amenities. Just three minutes drive to the fishing and marina town of La Cruz provides for authentic and very appealing local diversion. 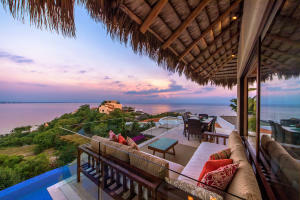 Fifteen minutes to Punta de Mita brings one to the elite hotels of St. Regis and Four Seasons as well as several golf courses connecting Real del Mar with additional sophisticated dining and leisure activities.